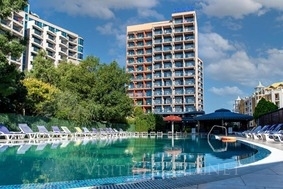 Condor Hotel in Sunny Beach resort on the Black sea in Bulgaria. Online booking. Deals and discounted rates. Location: Condor hotel is situated in the Northern part of Sunny Beach resort just 50 m. from the beach. stands in an impressive position overlooking the beach. Accommodation: Condor hotel offers 150 double rooms and suites. All roomes are comfotably furnished and offer balconies, mini-bars, telephones, shower/WC. Wine & Dine: The Restaurant and the bars (Lobby bar and Pool bar) of the hotel feature the finest international cuisine in a combination with the Bulgarian traditions. Sports and entertainment: Condor Hotel offers an outdoor swimming pool, conveniently located right next to it and guests can combine combine sunbathing on the beach with swimming in a heated pool. For the youngest guests there is a Children's section.